Students arrive at Milwaukee's Audubon Middle School on the first day of school in August 2018. Twenty-five percent of Audubon students are English learners. Emily Files speaks with the Wisconsin Policy Forum's Anne Chapman, who authored a new report on the challenges facing English Learners in Wisconsin. Many Wisconsin school districts that serve English language learners do not receive state help to offset the additional costs. A new report from the Wisconsin Policy Forum highlights how much those students are struggling in comparison to their peers, and how the state’s current funding system excludes many districts. The report is called Another Alarming Achievement Gap. English learners are far behind the state average on key indicators like third grade reading and eighth grade math scores. On the 2017-18 Wisconsin Forward Exam, just 17 percent of English learners were proficient in reading, which is 26 points behind the statewide average of 40 percent. Eighth grade math scores were even worse. Just four percent of English learners earned proficient scores – 34 points lower than the state average. "That particular achievement gap really jumped out at us," Wisconsin Policy Forum senior researcher Anne Chapman says. "Something’s going on there than requires a little more investigation." 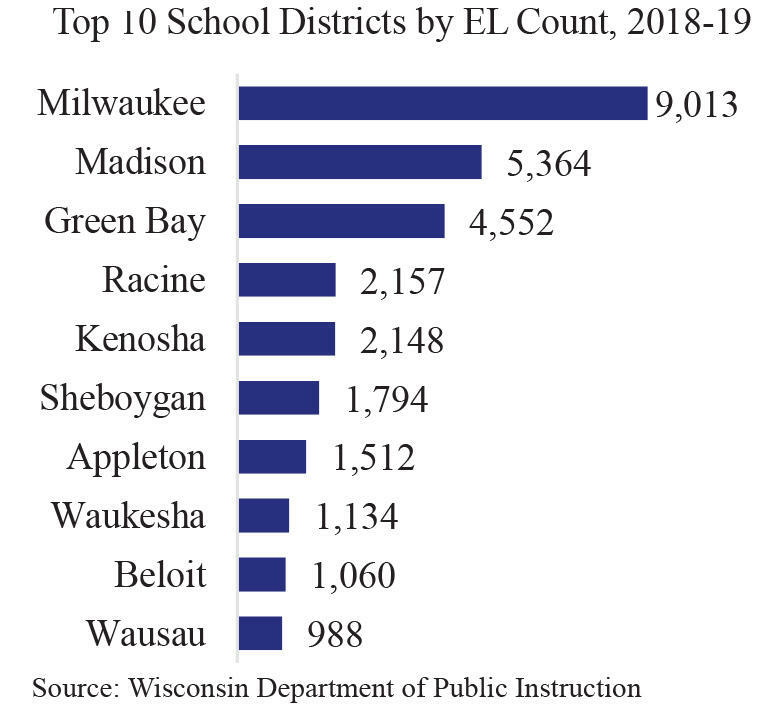 The Wisconsin Department of Public Instruction says English learners have the lowest achievement scores of any student subgroup, including low-income students and racial minorities. The poor scores coincide with a state funding system which has not kept pace with the growing number of English learners spread throughout the state. "The state only has one extra funding program to support those students," Chapman says. "It’s designed to help districts that have specific concentrations of English learners in certain grades." The Policy Forum report explains that bilingual-bicultural categorical aid goes to 52 districts serving about half of the state’s English learners. The other 300 or so districts that enroll English leaners do not receive additional aid specific to those students’ needs. The rural districts of Abbotsford, Arcadia, and Independence have the highest proportions of English leaner students, with more than 30 percent each. Chapman says none received state aid for their EL programs. "Those school districts have to pull resources from their general education programs to serve those students," she says. The districts that do qualify for bilingual-bicultural aid (like Milwaukee, with more than 9,000 English learner students) also have to find a way to pay for most EL expenses. The state reimburses only about eight percent of costs. Chapman says most other states ensure all English learners bring some extra funding to districts by either giving those students more weight in the state funding formula or providing a flat amount of additional per-student funding. Gov. Tony Evers has offered multiple proposals to increase English learner funding. He wants to boost the bilingual-bicultural aid reimbursement level to 30 percent by 2020. In his biennial budget proposal, Evers also recommends giving districts a flat amount of $100 per English learner. That would help schools that don’t qualify for bilingual-bicultural categorical aid. Tony Evers’ background is in education, including serving as the top education official in Wisconsin. Now that he is governor, Evers is proposing a raft of school funding changes. He delivered his first budget address on Feb. 28.